BY POPULAR DEMAND (thanks! ), A LUXURY UK WEEKEND RETREAT! Escape the buzz of London just an hour’s travel away; this dreamy spot in the Newbury countryside will be all ours for the last bank holiday weekend in May. We all know how important it is to get away and take time to nourish our bodies, minds and souls, but it’s not always that easy to find the time, hey. Well, this one requires minimal effort to get there and no extra days of holiday to be taken - whooop! - but still offers a real haven of rest, relaxation, rejuvenation, reset, really good food… any more ‘r’s?! I’m really, really looking forward to it and would love to have you with me. 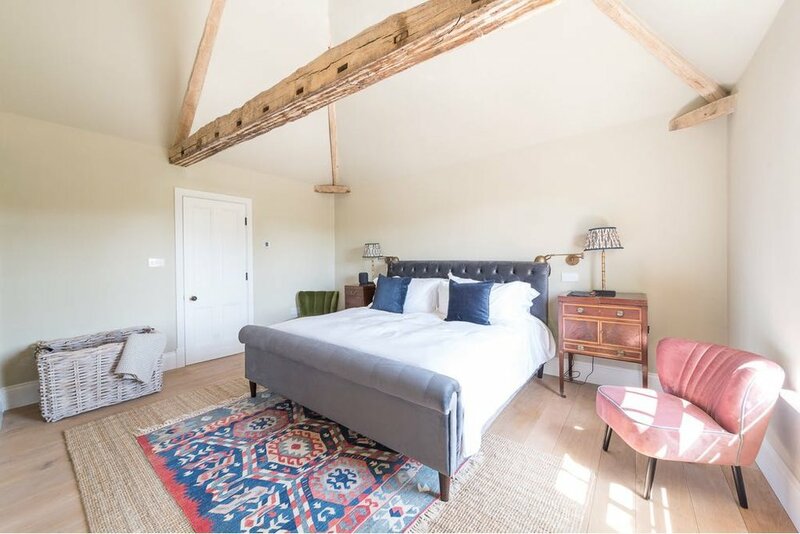 From Friday evening to Monday afternoon, we’ll take over these cosy and super-stylishly converted farm buildings (modelled shamelessly, the owner tells, me on Soho Farm House -but without the pretensions! ), set in acres of lush green fields and away from the stresses and distractions of daily life. Daily meditations, yoga twice a day, sound healing, voice work, journalling and ‘dreamweaving’ sessions; asana breakdown workshops countryside walks, cosy evenings with good conversation, and long nights of deep sleep… your soul will thank you! All of that will be fuelled by 3 seriously delicious, fresh, plant-based meals each day, cooked by my good pal and incredible chef, Serena (a.k.a. Luna Wellbeing). Teas, coffees and fresh fruit will be available to grab at all times of day. Free time to chill, walk, read, nap, for reflexology, explore the grounds etc. 5pm: Optional workshops: “living yoga” & yoga philosophy; voice work & sound healing playtime; yoga asana breakdowns & troubleshooting, ournalling & ‘dreamweaving. After dinner bonfires, music sessions, games, chats or quiet time. N.B. Serena, our chef, is also a fully qualified and experienced reflexologist, so when she’s not cooking your meals, she’ll be available to offer therapies. If there’s interest, reiki and massage therapies can also be arranged. I KNOW, what a weekend! I could tell you more about the rooms but the pictures kinda speak for themselves, hey? It’s a beautiful place; a real home-away-from-home, and we are lucky enough to be one of the first few retreats ever hosted here. Yoga will be in the stunningly remodelled and underfloor-heated barn, all meals will be taken together, family-style in the bright and airy farmhouse kitchen, and evenings can be lounged away in various snug spots of the house or out under the stars and around a bonfire, if the weather is kind to us! Newbury Station is about 45 minutes from London Paddington and a return ticket currently costs £37.50 I recommend getting the 5.03pm train from Paddington, and I will organise group transport from Newbury station to Vanners Farm so everyone arrives in time for dinner! (You are, of course, welcome to arrive by your own means, anytime after 5pm on Friday afternoon). Prices are based on two people sharing a room and include all food, yoga, workshops, transfer from Newbury station, and my unlimited attention, guidance & love for the entire long weekend! If you’d like a double room to yourself for a bit extra, just let me know. All payments can be made in instalments, no problemo. A £200 deposit will secure your spot. If you have any questions or requests at all, just drop me a line. I truly want this weekend to be everything you need, so let’s make that happen!